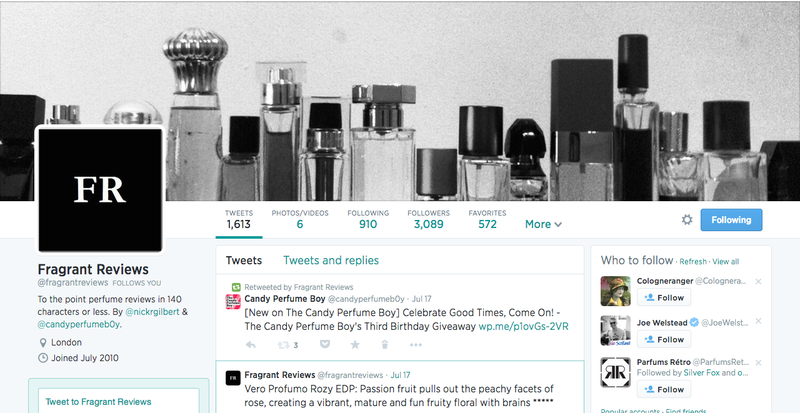 As you may know, Nick Gilbert, my scented partner in crime and I run a perfumed Twitter project called ‘@Fragrantreviews’, in which we review fragrances in 140 characters or less. Well, if you didn’t you do now and you’re in luck because it’s that time of the month where we round up all of the reviews from the last 30 days. Without further ado, I bring you all of our reviews posted in June 2017! They range from the sublime to the disappointing, and all that’s in between! Oh and don’t forget, if you’re based in the UK and fancy the chance of winning a £100 voucher to be used at Escentual, then click here to enter my fifth birthday giveaway. You’ve got to be in it to win it, as they say! As you may know, Nick Gilbert, my scented partner in crime and I run a perfumed Twitter project called ‘@Fragrantreviews’, in which we review fragrances in 140 characters or less. Well, if you didn’t you do now and you’re in luck because it’s that time of the month where we round up all of the reviews from the last 30 days. Without further ado, I bring you all of our reviews posted in June 2016! They range from the sublime to the disappointing, and all that’s in between! To follow us on Twitter just click here. As you may know, Nick Gilbert, my scented partner in crime and I run a perfumed Twitter project called ‘@Fragrantreviews’, in which we review fragrances in 140 characters or less. Well, if you didn’t you do now and you’re in luck because it’s that time of the month where we round up all of the reviews from the last 30 days. Without further ado, I bring you all of our reviews posted in May 2016! They range from the sublime to the disappointing, and all that’s in between! As you may know, Nick Gilbert, my scented partner in crime and I run a perfumed Twitter project called ‘@Fragrantreviews’, in which we review fragrances in 140 characters or less. After a short hiatus, Fragrantreviews is back and in the first of a monthly round-up of posts, I bring you all of our reviews posted in April 2016! They range from the sublime to the disappointing, and all that’s in between!